abandoned: The calf which was found with its ears and tail cut in Belgaum on Tuesday. On Tuesday morning, passers-by on Belgaum-Ganeshpur Road in front of Benon Smith School here were shocked to see an abandoned calf bleeding. The animal was in pain after someone had cut its ears and tail. With no help coming from anybody, the calf collapsed on the ground and people, who watched the animal suffer, did not inform the veterinary hospital or the Society for Prevention of Cruelty to Animals (SPCA), Belgaum unit. 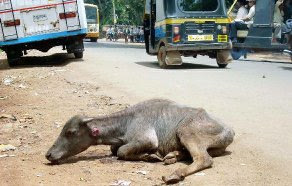 When this correspondent reached the spot, the calf was lying on the ground with very little energy to stand on its own. However, the bleeding had stopped. Street vendors present at the spot since morning said that it was not a case of accident. They alleged that it was a deliberate act of violence. Efforts to trace the owner of the animal went in vain. Some people tried to feed the animal with bananas, but it could not take them. On being informed, the staff of the veterinary hospital rushed to the spot and administered first aid and anti-septic medicine to the calf. But, efforts to trace the SPCA activists failed. Though the SPCA had opened an office on the premises of the veterinary hospital, it does not function from there anymore. A senior official in the hospital feared it to be a case of superstition. He said many people, including farmers and cattle owners in villages, cut ears and tails of cattle as mark of sacrifice in the hope of getting divine blessings. This incident has hurted me a lot personally, thus I request you all to please treat animals with love & care, also please educate people arround you especially the kids about the unconditional love the animals provide you & how much important they are in ones life. Human beings please stop this cruality on animals.